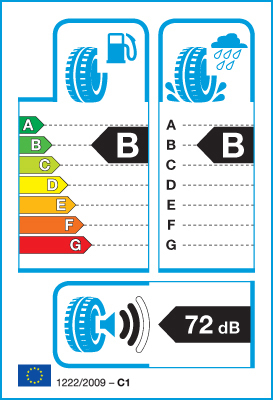 From November 2012, Tyres sold will have a tyre performance rating label. This covers 3 aspects of tyre performance. Fuel Economy Rated from "A" - Best Fuel economy to "G" - Poorest fuel economy. Wet Grip Rated from "A" - Best Wet grip / Braking to "G" - Poorest Wet grip / Braking. Noise Rated from "1" - Quietest to "3" - Noisiest . This information will appear on your Invoice. These performance ratings vary for Budget tyres while more expensive tyres may or may not have better ratings! Ask us if you want tyres to meet a minimum rating or need more information when ordering. Visit the Tyre Manufacturer's websites for more information.